Interstate Container Cambridge highlighted in Meat & Poultry Magazine's April issue. We’re all in this together. That’s a common refrain these days, particularly this time of year as Earth Day approaches and as the environmental movement gains traction. But besides sounding catchy, the phrase aptly describes the important differences even small changes among committed groups working in tandem can make to the well-being of the planet. Take, for example, something as seemingly straightforward as the shipment of poultry products. 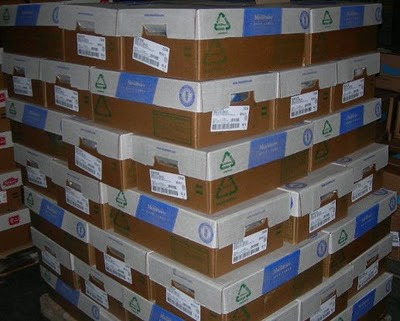 A recent collaboration between packaging supplier Interstate Container Cambridge, poultry processor Mountaire Farms and non-profit organization Global Green USA centered on the conversion of traditional wax-coated boxes to recyclable boxes for wholesale transfer packaging. 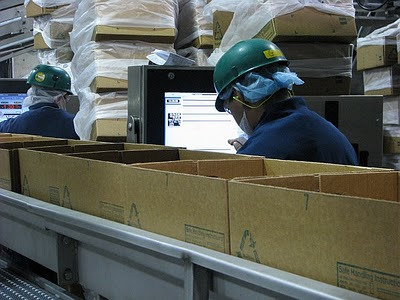 That change, along with a shift in packaging methods from ice-packed boxes to modified atmosphere (MAP) packaging, has led to a substantial reduction in greenhouse gases – estimated at more than 100,000 tons – and, in the process, lower costs and greater efficiency for the processor and end-user. This white-meat-goes-green initiative has been in the works for awhile. “We committed to it about five years ago,” says Pete Bugas, National Poultry Manager for Arlington, Va.-based Interstate Container, noting that Interstate first discussed the concept of wax-alternative boxes in the early 2000s and tapped into the work of Global Green by 2005. “They provided the format of bringing in vendors and suppliers and pushed and prodded for the program to succeed,” he recalls. After numerous discussions and exhaustive planning, Interstate Container Cambridge and Mountaire Farms began pioneering recyclable MAP about a year ago through the nation’s largest food distribution center, Hunt’s Point in the Bronx, N.Y. The pilot program, which ended in September, was part of Global Green’s effort to achieve 100-percent recyclable wholesale transfer packaging at that facility. “We wanted to use New York City as a test for a recycling program with national potential focusing in the foodservice industry, ”explains Annie White, director of the Coalition for Resource Recovery for Global Green USA. She says Hunt’s Point is an ideal microcosm of what can be done in this segment of the food chain. “In New York, there are 200 tons of waste a day coming from a combination of retail and food service and 700 tons of that is paper.” The use of corrugated boxes was seen as a particular opportunity, she says. It was a good chance for Interstate container to test its recyclable boxes, according to Bugas. “Above all and no matter what, at the end of the day the box has to hold up. Plant conditions are extremely wet, the product is put in coolers and reefers and when it gets to New York, it sits on the dock in the middle of the summertime,” he points out. For Mountaire Farms, the New York City distribution center was a major hub for its food service business and was deemed an ideal place and time to act on the company’s commitment to greener packaging. “New York is a tough market and there is a lot of trash that leaves Manhattan every day,” Saywell says. The change at Hunt’s Point began on a pallet-by-pallet basis, Saywell says, but the trial swiftly gained speed based on its immediate success. After a month or so of test runs, the switch was made to entirely recyclable wax-alternative boxes from Interstate Container. Beyond the tangible differences to the New York City market, the Hunt’s Point trial has had a more widespread effect. “Food from all over the world is shipped through Hunt’s Point. When we reach 100 percent there, it will show a step change, and that has been our interest,” White says. According to White, such a step-change actually could be a giant leap: 1.5 million tons of non recyclable wax-coated corrugated boxes are discarded in the U.S. each year. Replacing those boxes with corrugated recyclable boxes would have the same effect as removing 1 million passenger vehicles from the road, she points out. And the advantage wouldn’t only be for the Earth. According to Global Green’s estimates, U.S. grocers and restaurateurs would save up to $63million annually in disposal fees. Last year’s trial at Hunt’s Point went so smoothly that Mountaire Farms decided to extend the conversion company-wide. 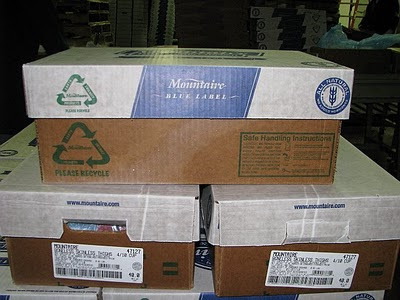 In the months since the pilot program ended, Mountaire Farms has converted the boxes and packaging methods at its main facility in Lumber Bridge. N.C. – the nation’s largest poultry plant – and is currently working on a change over its other plants in Delaware, according to Saywell. During that short time frame Saywell reports that pivotal reductions have been achieved all around. “As we went to a drier packed product, we were also able to reduce the size of our boxes and ultimately use less water. That was another key piece of the equation for us,” he observes. While Mountaire Farms moves toward recyclable packaging and greener packaging methods, it has tried to extend the message about the benefits of sustainability through its own chain. “We developed a kind of recyclable logo to put on all of our corrugated to make the customer aware that they don’t have to segregate the product anymore. And the customers have said they enjoy the change because it helps them, as well,” Saywell says. At this point, with those throughout the food chain looking for ways to reduce costs, streamline distribution and pursue greener strategies, the decision to shift to recyclable wholesale MAP packaging may become a more popular one. Saywell thinks it’s a proverbial no-brainer for all meat and poultry processors to jump on the recyclable box bandwagon. “Ultimately, it’s the right thing to do. It’s very hard to not do the right thing when you have the opportunity,” he notes. White, meanwhile, says that beyond processors that sell to wholesale, the entire food chain can literally think outside the box when it comes to sustainable packaging materials and methods. “I think that the time has come because when a company can do something green and it makes business sense – that’s when it is a pretty easy decision,” she says. Right now, the timing is especially ripe for fresh food suppliers like meat and poultry processors and produce companies and for restaurateurs that are in the midst of a major green movement. Seizing the perfect-storm opportunity, Global Green made an earnest plea to the industry earlier this year, calling on food packagers to convert to this newly achievable green standard. From a packaging supplier perspective, Bugas says the Hunt’s Point trial has already generated a buzz in other parts of the country. “I know Global Green has great interest in replicating this model in other metropolitan places,” he reports, citing urban areas like Chicago that currently use a lot of wax boxes in the wholesale distribution market. Interstate has received positive feedback as well and is fielding inquiries from other meat and poultry and fresh food companies.